Blockchain is one of the many disruptive technologies that has just started to gain traction among many people. Why? This is because blockchain is the founding technology for many cryptocurrencies like Bitcoin, Ethereum, and Litecoin. How exactly does Blockchain work though? 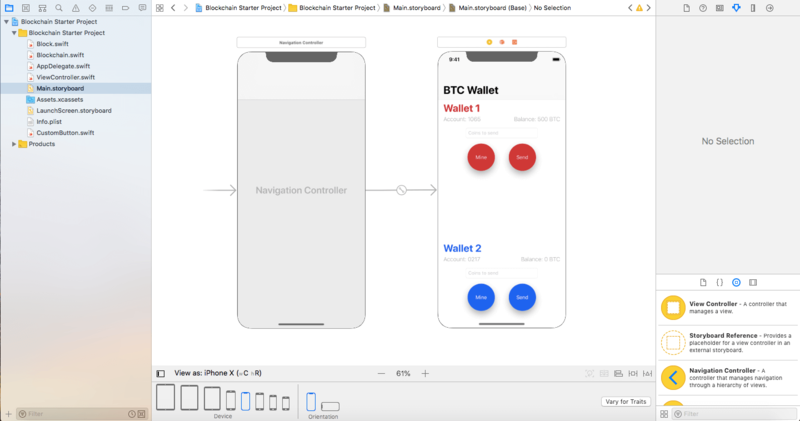 In this tutorial, I’ll be covering everything there is to know about the blockchain technology itself and how to make your own “blockchain” in Swift. Let’s get started! As the name implies, blockchain is a chain comprised of different blocks strung together. Each block contains 3 pieces of information: the data, a hash, and the previous block’s hash. Data – Depending on the use, the data that is stored in a block depends on the type of blockchain. For example, in the Bitcoin blockchain, the data stored is the information relating to the transaction: the amount of money transferred and the information of the two people involved in the transaction. Hash – You can think of a hash as a digital fingerprint. It is used to identify a block and its data. What’s important about hashes is that it’s a unique alphanumeric code, usually about 64 characters. When a block is created, so is its hash. When a block is modified, the hash is also modified. In this way, hashes are vital if you want to detect any changes made to the block. Previous block’s hash – By storing the hash of the previous block, you can see how each block is linked to form a blockchain! This is what makes a blockchain so secure. As you can see, each block consists of data (not shown), a hash, and the previous block’s hash. For example, the yellow block contains its own hash: H7S6, and the red block’s hash: 8SD9. This way, they all form a chain and are connected as such. Now, let’s say that a malicious hacker comes along and tries to modify the red block. Well remember, every time a block is modified in any way, the hash of that block changes! That way when the next block runs a check and sees that its previous hash does not match, it will not be accessible to the hacker since it effectively cut itself away from the chain. This is what makes blockchain such so secure. It’s close to impossible to try to go back and change any data. While hashes do provide a great sense of secrecy and privacy, there are two more safeguards to keep blockchain even more secure: Proof-of-work and Smart Contracts. While I won’t be going into the details, you can read more about it over here. The last way a blockchain secures itself is based on its location. Unlike most data which is stored on servers and databases, blockchain uses a peer-to-peer network (P2P). A P2P is a type of network that allows anyone to join and the data on that network is distributed to each recipient. When someone joins this network, they get a full copy of the blockchain. When someone creates a new block, it is sent to everyone on the network. Then, through several complex programs, the node determines whether or not the block has been tampered with before adding it to the chain. That way, the information is available for everyone, everywhere. This may sound familiar if you’re a fan of HBO’s Silicon Valley. In that TV show, the protagonist uses a similar technology to create his new internet. Since everyone has a copy of the blockchain, or nodes, they can form a consensus and determine which blocks are valid and which are not. Therefore, if you want to hack one block, you’ll have to hack more than 50% of the blocks on the network in order to pass along your information. This is why blockchain is perhaps one of the most secure technology created in the past decade. Now that you have an understanding of how blockchain works, let’s get started with our sample application! Download the starter project here. As you can see, we have two Bitcoin wallets. The first account, Account 1065, has 500 BTC available while the second account, 0217, has nothing. We send bitcoins to the other account using the send button. To earn BTC, we can press the Mine button which will give us a reward of 50 BTC. Basically what we are doing is observing the transaction that takes place between 2 Bitcoin accounts by looking at the console when the app is running. You’ll notice that in the sidebar there are two important classes: Block and Blockchain. Opening these files, you’ll see that they’re empty. That’s because I’ll walk you through writing the logic for these classes. Let’s get started! var hash: String! var data: String! var previousHash: String! var index: Int! Now that we have defined the Block class, let’s define our Blockchain class. Switch over to Blockchain.swift to begin. Just like before, let’s try to break down a blockchain into its fundamentals. In very basic terminology, a blockchain is nothing but a chain of blocks strung together, or in other words, a list with items held together. Does that sound familiar? If it does, that’s because it’s the definition of an Array! And this array is held together by blocks! Let’s add this to our code! Quick tip: This applies to almost everything in the world of Computer Science. 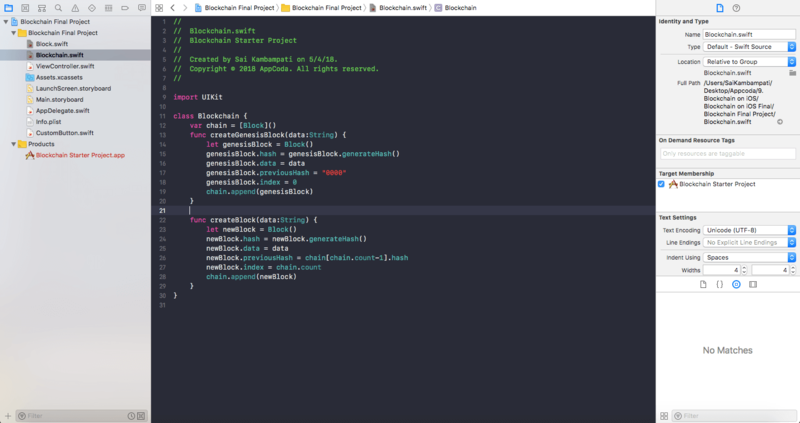 If you ever encounter a large problem, try to break it down into small components in order to build you way up and solve the problem, just like what we did with figuring out how to add blocks and blockchains in Swift! You’ll notice that inside the array is the Block class which we defined earlier. That’s all the variables we need for the blockchain. To finish up, we need to add two functions to our class. Try to answer this question based on what I taught earlier. What are the two main functions in a blockchain? The first function we are adding is creating the genesis block. To do this, we create a function which takes in the data of a block as input. Then we define a variable named genesisBlock and make it of type Block. 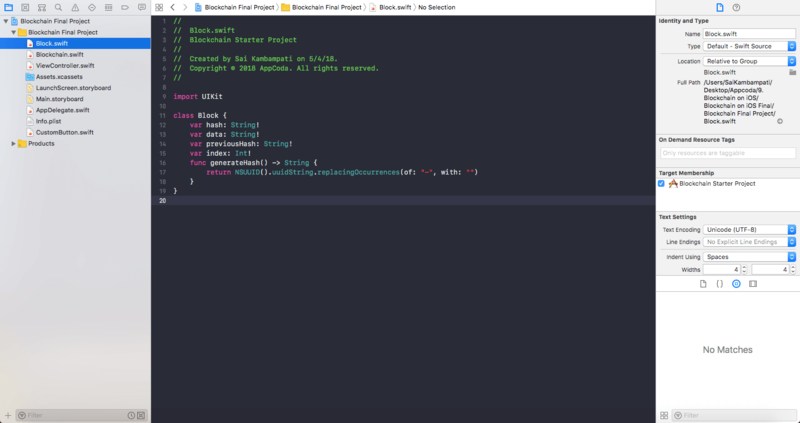 Since it is of type Block, it has all the variables and functions we defined earlier in Block.swift. We set the hash to generateHash() and its data to the input data. Sice it’s the first block, we set the previous block’s hash to 0000 in order to let us know that it’s the initial block. We set its index to 0 and we append it to the blockchain chain. The next function we create is applicable for all the blocks after the genesisBlock and it creates the rest of the blocks. You’ll notice it’s very similar to the previous function. The only difference is that we set the previousHash to the previous block’s hash and by setting its index to its place in the blockchain. And that’s all! We are done defining our Blockchain! Your code should look like something below! 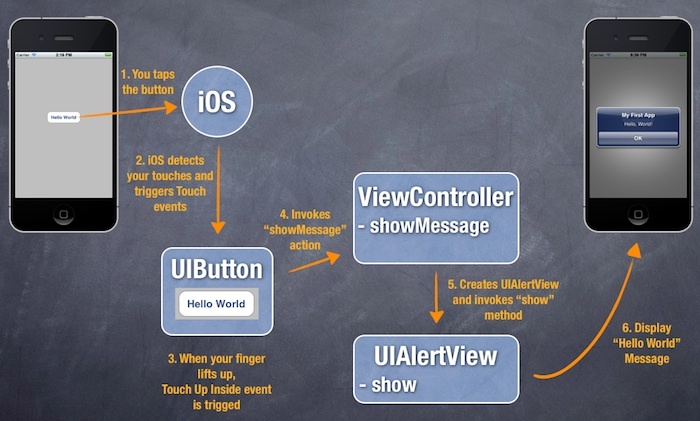 Next, we’ll connect all the pieces to our ViewController.swift file and see it running in action! Switching over to ViewController.swift, we can see that all our outlets are connected. All we need to do is handle the transaction and print them to the console. We defined an account with number 1065 and another account with number 0217. We also added a variable called bitcoinChain to be our blockchain and we let the reward be 100. We need a master account from where all the bitcoins come: this is our genesis account with number 0000. It has 10 million bitcoins. You can think of this account like a bank where for every reward, 100 bitcoins are taken out of it into the rightful account. We also define an alert which will be shown every time a transaction could not be completed. Now, let’s code some generic functions which will run. Can you guess what these functions are? The first function is for handling the transaction. We make sure that the sender and recipient accounts receive or deduct the right amount and this information is recorded into our blockchain. The next function is for printing to the console the entire record- it will show each block and the data in each block. The final function is for verifying whether the blockchain is valid by making sure the previous block’s hash matches with the information the next block has. Since we won’t be demonstrating any hacking methods, in our demo, the chain will always be valid. Here’s the generic transaction function we have. Enter the following code right underneath the place where we defined our variables. 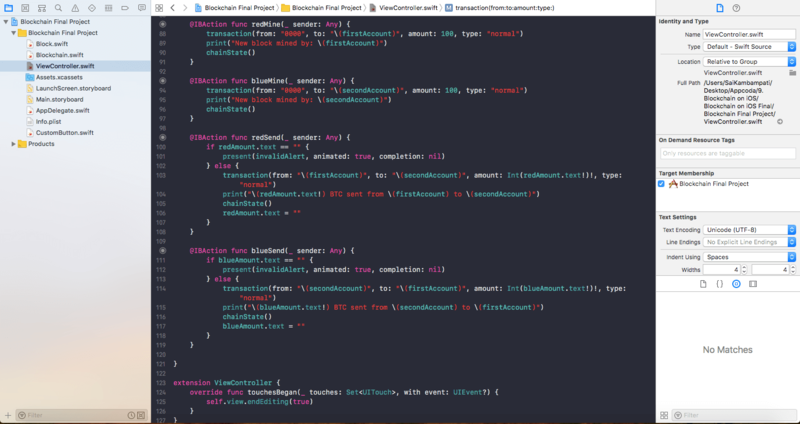 This may seem like a lot of code but at its core, it’s just defining some rules to follow for each transaction. At the top, we have 4 parameters for this function: to, from, amount, and type. To, From, and Amount are self-explanatory but Type is basically defining the types of transaction. There are 2 types: normal and genesis. A normal type of transaction would be between account 1065 and 0217 where as a genesis account would involve the account 0000. The first if-else condition regards the from account. If it doesn’t exist or is short of money, we display the Invalid Transaction alert and return the function. Otherwise, we update the values as is. The second if-else condition regards the account we send it to. If it doesn’t exist, then we leave it alone and return the function. Otherwise, we send the right amount of bitcoins to the account. The third if-else statement deals with the type transaction. If there is a transaction involving a genesis block, we create a new genesis block, otherwise, we create a new block storing the data. At the end of every transaction, we want to see a list of all the transactions to make sure we know everything that is going on. 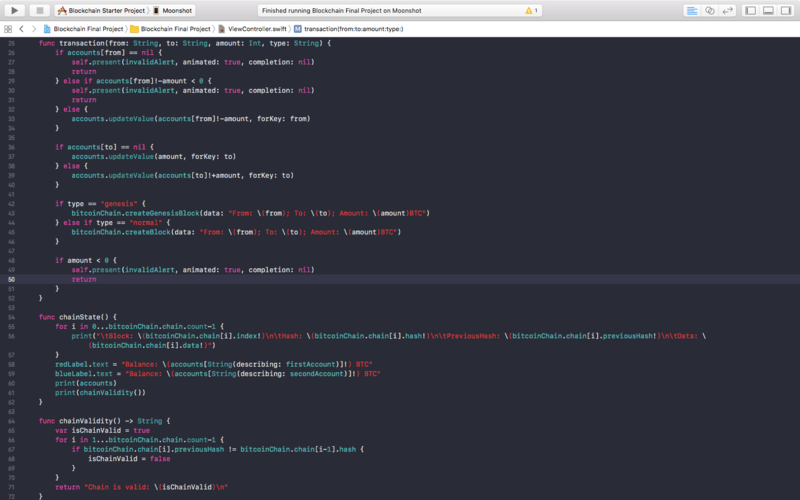 Here’s what we type right underneath the transaction function. 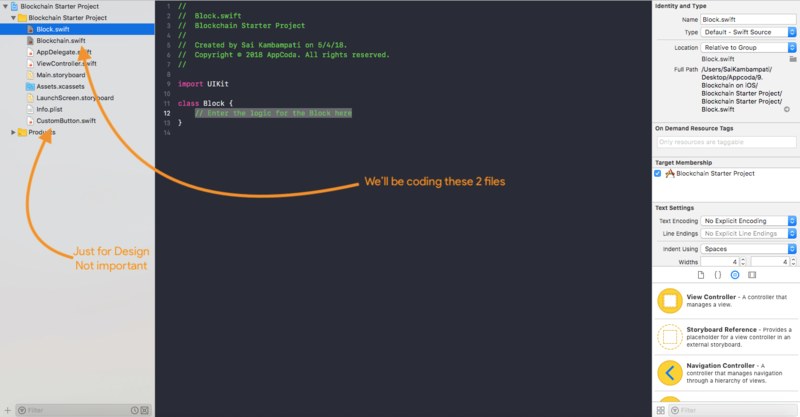 This is a simple for loop where for every block in out bitcoinChain, we print the Block number, the hash, the previous block’s hash, and the data is stores. We update the labels on our UI so that they show the correct amount of BTC in each account. Finally, print a list of each account (which should be 3) and check the validity of the chain. Now you should be getting an error on the last line of that function. This is because we haven’t defined our chainValidity() function yet so let’s get to it! Similar like before, we iterate over every block in our bitcoinChain and we check to see if the previous hash of a block matches with what our current block says it is. All that’s left is to just link up the buttons to the functions. Let’s begin the final phase now! Now let’s see what to add in the remaining four functions: redMine(), blueMine(), redSend(), and blueSend(). In the first mining function, we use our transaction function to send 100 BTC from the genesis account to our first account. We print that a block was mined and print the chainState. Similarly, we send 100 BTC to our second account in the blueMine function. The sending functions are also slightly similar. 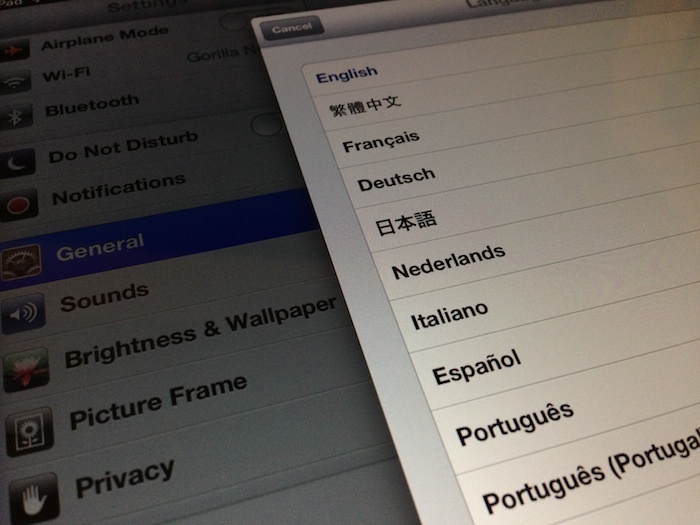 First, we check to see if the redAmount or blueAmount text field is empty. If it is, we display the Invalid Transaction alert. If not, we’re clear to go. We use our transaction function to send money from the first account to the second account (or vice versa) with the amount entered and set the type to normal. We print how much has been send and we call our chainState() function. At the end, we clear the text field. And we’re all done! Check to see if your code matches the image below! 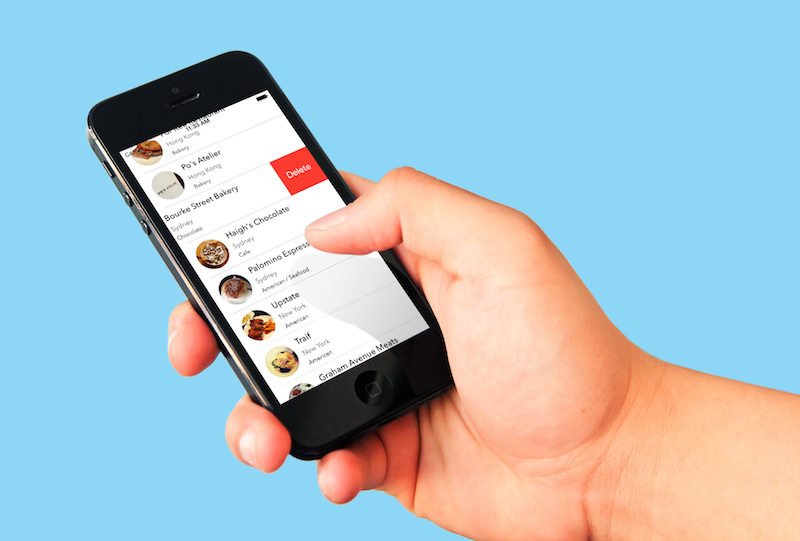 Run the app and try it out! 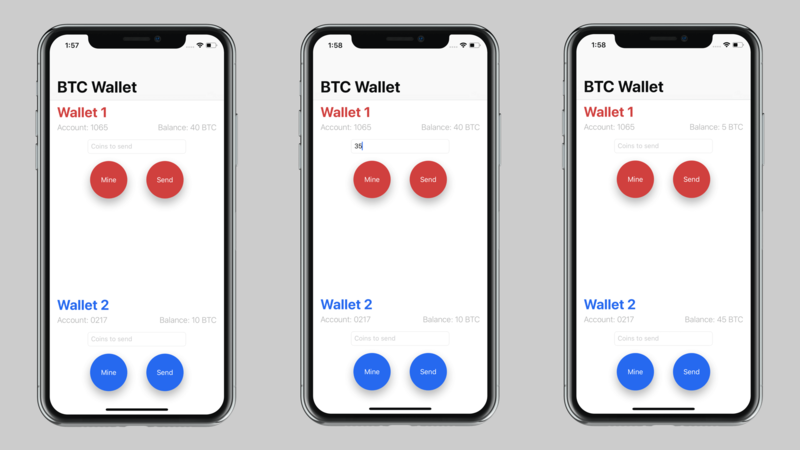 From the front end, it looks like a normal transaction app, but you’ll know what’s going on behind the scenes! Play around with the app transferring BTC from one account to another, try to trick it, and have fun with it! In this example, we used Blockchain for cryptocurrency but can you think of any other ways blockchain can be used? Let me know in the comments below! Hope you learned something new!